Several years ago I bought a used European-made car at an auction. This particular type of car has a well-deserved reputation for unrelenting mechanical problems. After numerous breakdowns, my mechanic finally told me that the car was unfixable. Understanding that mechanics rarely admit hopelessness to a paying customer, I had to concede that my bargain car was doomed. As the truth sank in, I knew the Jaguar dream was over. I had to formulate a plan for life after my car debacle. In counseling, I sometimes deliver the same bad news to people. I’m willing to work long and hard on most human problems. I go into every case with the belief that we can develop a collaborative plan to fix whatever is wrong. Unfortunately, sometimes, no matter how much creative problem-solving we apply to a situation, it just cannot be fixed. The people, relationships, jobs, hopes and realities are just too broken. Sure, some people give up too soon. But more often than not, I see people hang on to a train wreck way too long. Sooner or later, even the most optimistic person has to embrace the obvious. If I can’t fish or cut bait, what is my reasonable next move? In view of that which will not change, what do I need to do? The first answer can be both freeing and disheartening. For many people, moving forward from the unfixable is a relief. For others, it is akin to asking them to compromise their very souls. For example, one missionary came in to my office regularly to complain about his job. He had tried numerous strategies for changing his working conditions but was consistently disappointed with the results. Finally, I pointed out that he was like a person who owns a dog but really wants a cat. He tries to teach the dog to purr and meow and crawl up in his lap. He feels disappointed and bitter when his dog slobbers and barks and chases cats like dogs do. Instead of putting so much effort into making his dog a cat…um…why not just get a cat? Often the what-do-I-need-to-do-now involves letting go of the impossible. We cannot embrace something new when our arms are full of old broken stuff. When we do finally allow ourselves to let go, the next move is usually fairly obvious. In view of that which will not change, who do I need to be? This question is definitely more abstract and existential. Often our very identity is wrapped up in the irreparable things we desperately hold onto. That person or role or expectation has defined who we are. When my dad died, the foundations of my mom’s world were shaken. She had always been a rancher’s wife, Ed’s wife, a housewife. In one day, the ranch and Dad and even the house were gone forever. In the years following his death Mom discovered who she was apart from his big shadow. Some people reinvent themselves by choice. Mom did it out of necessity. She discovered that she was smart enough, resourceful enough and wise enough to make a life of her own. She missed Dad but accepted that she would never…could never…be the same person. And that wasn’t necessarily bad. As Dan the Mechanic handed me the keys to my incurably broken foreign car, I asked him, “What would you do if you were me?” He didn’t hesitate in his reply, “I would trade it off. Today. Don’t wait.” I did exactly that. I drove to the closest Ford dealer and traded the junker for a nice reliable American-made car. My identity shifted from a Jag man to a guy who drives Fords. Practical. Affordable. And fixable. I didn’t stop driving cars. 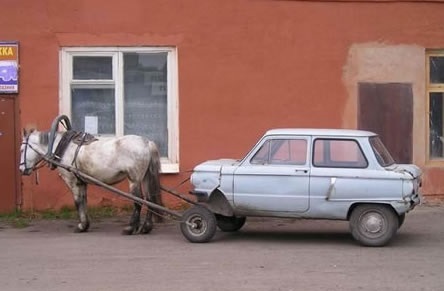 I didn’t try to make my broken car into a pony cart. I simply stopped trying to put a pig in a prom dress. I came away happier and the pig was grateful too. But hey…it’s fortnight. Get out there and enjoy it. But don’t hold on too tight. The Lord is still making fortnights. He still brings them around every two weeks.